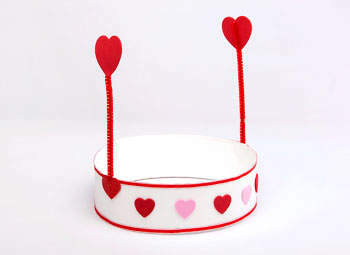 Add some fun and whimsy to Valentine’s Day with our valentine hat that wiggles when you walk. Trim the strip so that there is approximately 1″ of overlap when wrapped around the child’s head. Use the pencil to mark the sides of the hat where the chenille stems will go. Attach two identical heart stickers to the top of each chenille stem. They should be facing each other so that they stick together and trap the stem inside. Lay the hat on the table with the taped side facing down. Use a small piece of tape to attach each chenille stem to the marks that you made in the previous step. Use heart stickers to secure them in place. Decorate the hat by placing heart stickers across the front. We alternated red and pink. Glue the red trim to the top and bottom edge of the hat. Let the glue dry completely. Using the mark you made in step 1, tape the hat into a circle. It’s ready to wear!